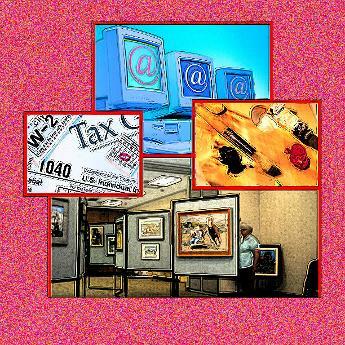 Practical, down-to-earth advice and information about everything from doing your taxes as an artist or writer to tips about photographing your work for the web or spotting a scam artist. Fresh, interesting blogs about how to succeed as an artist or writer,connect with your peers and improve your skills as a writer or artist. Guest bloggers welcome. My name is Gail Daley and I am a self-taught artist with a background in business; for many years, I worked at the IRS and when I retired, I took over the office management of my husband’s pool service company. After a few unsatisfactory (and expensive!) attempts at using professional promoters, I began doing my own promoting and marketing of both my art and for my husband, developing our own advertisements and brochures. I have created and published my own web site: www.gaildaleysfineart.com. I am president and newsletter editor of Clovis Art Guild in Clovis, California, of which I am also President. As Director of Art-Tique, http://www.art-tique.org I publish a free on-line newsletter concerning local art events and I find places for local artists and writers to show and sell their work. I publish a blog, The Practical Artist http://www.thepracticalartist.com where I hand out advice to artists on such things as how to keep good business records, how to put on an art show, things to take with you to art fairs, and how to prepare your work to be seen by the public, etc. I was recently inspired to finish several novels I started in my twenties, by my son, Andrew Daley also a writer, (http://www.worldsofAndrewDaley.com). The first two books in my Handfasting trilogy A Year And A Day and Forever And A Day are finished and are available on Kindle in e-book format and also in softcover books on Amazon. I am currently working on the third book All our Tomorrows, and I hope to finish it by June. In between writing, I paint. Since I am a “starving artist”, I work out of my home. I have a husband of 40+ years who takes me to beautiful places to paint while he and his friends pan for gold, a son who writes juvenile fiction, and we are owned by 3 cats. As an artist, I concentrate on the interconnected relationship between humans, nature, and the strong bonds between humans and animals. My art has been described as “narrative art”. For me, all art should tell a story whether it is simply where you were and what you were thinking when you created it or if it brings a piece of past or present to life. I think God created all of us to be part of a whole, not just individuals. While our individuality is important, equally important is our connection to each other. I feel art should have an emotional impact on the viewer. I do not care how technically perfect the artwork may be; if a piece of art does not evoke some type of emotion, to me it is not art. For myself, I also prefer my art to say something positive. We owe it to ourselves not to spread gloom and despair all over everyone! There is enough of that out in the world without artists celebrating it!